Dude, What’s Up With The Raised Fist? “My use of the black fist [or raised fist] is pulling from a symbol the Black community has used since the Civil Rights Movement as one of solidarity and racial/cultural pride as Black Americans, especially during darker times. Think of the raised fist given at the 1968 Olympics by Tommie Smith and John Carlos. My interpretation of its usage here is a gesture of Black strength, power, and identity. Though it can be attached to politics and ideologies, my own use of it for BlackCatholic is and always has been completely divorced from those meanings. 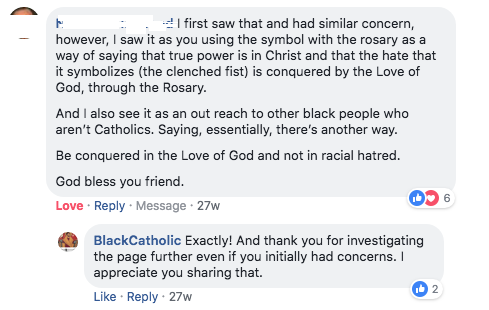 I combine my particular interpretation of it with my Catholic faith (see the rosary around the fist in the logo) as a symbol of “I’m proud to be Black and Catholic, and draw my strength as a Black person from God and His Catholic Church. In addition, since it is a symbol known and enjoyed in the Black community, my usage of it is a way to help reach out to other Black people for the Catholic Church. I strive this page [apostolate] to be absolutely faithful to the teaching Magisterium of the Church. Like stated in the pinned post on this page, if you feel that something is off, please reach out in the comments or inbox me [for the website, send me a message here]. The above screenshots not only show the general intent/goal of my design but also that people saw it as something positive. It also may show the difference a rosary makes! The whole “affair” only lasted a day or so due to a number of people (complete strangers to me) defending my apostolate and because of my statement being posted both in the original comment section of the other Catholic page and on my own page. The same other Catholic page would go on to share two articles I wrote for uCatholic, and they tagged my page when the articles were shared. There was no other significant incidents of controversy regarding the symbol. Anyway, I hope this helps in any way it can.